Paris Adrift is a high-concept puzzle novel, of the type recently popularized by Claire North (The First Fifteen Lives of Harry August (2014) and subsequent novels), and whose other examples might include Iain Pears’s Arcadia (2015), Kate Atkinson’s Life After Life (2013), Lauren Beukes’s The Shining Girls (2013), and stretch backwards to Steven Hall's The Raw Shark Texts (2007) and Scarlett Thomas's The End of Mr. Y (2006). Time travel is often, though not always, a component in these novels (it is in Paris Adrift), but what ties them together is the revelation that reality is not what it seems—that there are levels to it that only special people can access. These people often congregate in secret societies—there is one in Paris Adrift, though perhaps mercifully its presence in the novel is fairly minimal—and often find themselves turning over the question of whether, and how, to use their powers to affect the world. Paris Adrift is also a personal novel, about a young woman escaping a bad family situation by immersing herself in a demimonde where, as she's repeatedly reminded, everyone eventually leaves. The novel's title might have been more accurately rendered as "Paris, Adrift," since these are the city and the emotional state that heroine Hallie finds herself immersed in for most of the novel. Having taken a year away from university and cut herself off from her family back in England—for reasons we won't discover until much later in the story—Hallie washes up in Paris's eighteenth arrondissement, home to the Moulin Rouge and other remnants of the bohemian past. There she takes a job at a raucous bar named Millie's, where she works from nightfall to sunrise alongside a multinational crew of lost twentysomethings—all, like her, just passing through. Paris Adrift is also, finally, a political novel, about a group of people just on the cusp of adulthood facing up to the spectacular mess that previous generations have made of the world: climate change, inequality, refugee crises, Brexit, Putin, Trump. As Hallie and her friends wonder what, if anything, can still be done about any of these problems, a new political party, the Moulin Vert, builds around the charismatic leader Aide Lefort, whose ideas about saving the world end up being tied to the "anomaly" that Hallie discovers in the keg room at Millie's, and which gives her the power to travel anywhere in Paris's past or future. It should come as no surprise that these three aspects of Paris Adrift succeed only to varying degrees; but what is interesting is how they interact with and affect each other. The time travel plot of Paris Adrift, for example, is rather underpowered. In a prologue, we're introduced to The Order of Janus, a society of time travelers, each bound to a different anomaly in various parts of the globe. We meet them in the nuclear wasteland of the twenty-fourth century, where they agree to break their sacred "code of practice" and nudge history in a less destructive direction—which is why Hallie ends up taking the job at Millie's and discovering "her" anomaly. In the bulk of the novel, however, the Order of Janus are barely present, and their vaunted code of practice turns out to be a narrative-killer. It's eventually revealed that time travel through the anomalies is addictive and harmful, ultimately leading to travelers losing their corporeal selves and going insane. In making this choice, Swift puts herself in a narrative bind. There's not a lot of fun to be had watching characters decide not to time travel, and not much tension in the question of whether they will eventually choose to chance it one last time, for the good of humanity. 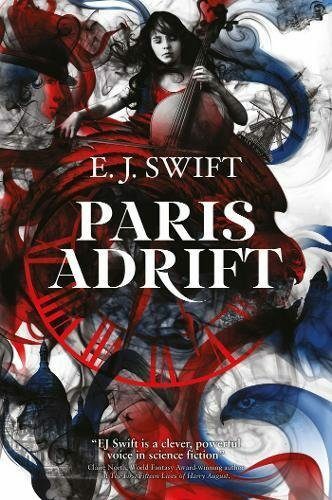 It's here that the personal aspect of Paris Adrift comes to the fore, with the allure of time travel acting as an analgesic for Hallie's disconnect from the present. Having cut herself off from her real life, she goes on to cut herself off from the half-life she's built in Paris, living only to travel through the anomaly. Time travel becomes a metaphor for Hallie's refusal to face up to her problems and move on with her life, which has a great deal more emotional force than the informed hazard of addiction. Other subplots revolving around Hallie's life are less consistently successful. She forms a friendship with a fellow Millie's employee, Gabriela, who eventually becomes sullen and resentful over Hallie's obsession with the anomaly. The novel clearly expects us to be on Gabriela's side, but at the same time Swift also makes it clear that Gabriela has serious emotional problems of her own—she is convinced that a supernatural force is keeping her in Paris despite her own desire to return home to Colombia, but both Hallie and the narrative make it plain that this belief is a symptom of a psychological condition, which she begins projecting onto Hallie when it becomes clear that a real supernatural force exists in Millie's. The two women's friendship ends when Gabriela commits a shocking act of violence, but in its wake most of the characters—including Hallie herself—seem to feel that the fault for this falls mostly on Hallie, in a development that is both puzzling and unsatisfying. More successful is the slow reveal of Hallie's problems at home. Despite her dark hints about them, Hallie's family turn out not to be abusive so much as neglectful, incapable of offering her the nurturing, loving environment she craves. Paris Adrift thus becomes a rare instance of a story about someone with a troubled family history who does not make peace with their family. Growing up, in Hallie's case, means accepting that she will never get what she needs from her narcissistic mother, cowed father, and distracted siblings, and choosing to make a life without them. It's here, too, that the time travel plot, and its hazards, tie into the emotional one—instead of hiding in the past or the future, Hallie must learn to face up to the inadequacies of the present, and to try to make a better life in it. If Paris Adrift were merely this story, about a lost girl nearly taking a supernatural escape hatch out of her life, it would be a satisfying—if perhaps rather slight—affair. It's the political aspect of the novel that leaves me unsatisfied and also a little troubled. Around the middle of the story, Hallie and her friends attend a rally in which Aide Lefort makes a speech. The characters all react as if they've been in at the start of a major political movement, but this reader was left puzzled, as Lefort's speech is nothing but a string of feel-good platitudes with no concrete policy goals. "France was once great," shouts Aide Lefort. "She built that greatness upon rotten foundations. But she can become great again, if we can only reach across the forces that would divide us. Every act, however small, is a gesture against the tide. We must embrace our neighbors as sisters and brothers. Forget our terrors. Renew our hope. Rebuild our broken world. Friends, I ask you this: will you join me?" To be fair, the genre of content-free inspiration is a storied political tradition—the most obvious example being Barack Obama's "Yes We Can" speech after winning the New Hampshire primary in 2008. But, even leaving aside that it is impossible to convey anything like the force of Obama's oratory in a written text, he was speaking within a context—a political party, a platform, months of campaigning—that Aide Lefort doesn't have. full of tips and chirpy advice. Helping others is psychologically proven to improve your wellbeing! Why not introduce yourself to your neighbors? Volunteer at a food kitchen. Join a carpool. Recycle everything you use for a week. Talk to a homeless person and share their story. Offer your spare room to a refugee family. Donate to a humanitarian crisis. This kind of atomistic, consumer-level approach to political change feels so out of touch with the bone-deep frustration expressed by the Millie's employees in earlier parts of the novel that it almost feels as if they've joined a cult (especially when it becomes clear that the Moulin Vert have no intention of standing for elections). When Gabriela, for example, announces that she's becomes a vegetarian because meat production hurts the environment, it seems impossible that none of the politically-aware young people around her push back against the notion that this represents meaningful political action. If it seems a bit unfair to ding Swift for not having invented a more persuasive political philosophy, this is a trap she lays for herself. The final chapters of Paris Adrift revolve entirely around Aide Lefort, the Moulin Vert, and how both of them are necessary to save the world, or at least Paris. From another time traveler, Hallie learns that in the late twenty-first century Paris will become a fascist dystopia ruled over by the Front National, whose ascent becomes possible after the assassination of Lefort. It's up to Hallie to choose to break the code of practice by traveling to the night of the assassination to save Lefort's life, and thus the future. It's perhaps unsurprising that a novel so rooted in the notion of special people will also filter its politics through the lens of great men and women, whose life or death determine the course of history. I haven't said much about Hallie's adventures in time, but one of them in particular left a bad taste in my mouth. In it, Hallie travels to 1942, and finds herself sharing a crawlspace with a young Jewish woman, Rachel Clouatre, who has just barely evaded the roundup of French Jews by Vichy officials. It's obviously not Swift's fault that the subgenre of "time traveler helps to save a Jew from the Nazis" has been at the forefront of Holocaust fiction's devolution into Holocaust Kitsch, but one might have expected a little more awareness of this fact in 2018. In fairness, Hallie doesn't actually save Rachel's life so much as her soul—she helps persuade her to continue in her musical career despite the horrors she's witnessed, which ends up being related to preventing the nuclear apocalypse. Nevertheless, there is something unbearably glib about using the Holocaust as the backdrop to a time travel story, much less one in which the time traveler changes things for the better. That Swift did not realize this feels like the epitome of Paris Adrift's simplistic approach to politics, and the horrors of history. It's all very well and good to talk about the importance of small acts of kindness and human connection, but in the face of something like the Holocaust, it should be obvious that they are insufficient. There’s a similar glibness in play when Paris Adrift insists repeatedly that Aide Lefort’s survival is a necessary and sufficient condition to prevent fascism—as if the voters who put in power the Front National (or, for that matter, Donald Trump) aren’t a factor in the equation. As a personal story, a meditation on being lost at the beginning of your life, and on learning to define yourself as an adult outside of the confines of your childhood, Paris Adrift works very well. Its use of time travel as a metaphor for aimless wandering that has to be outgrown is touching, maybe even inspired. But the heart of the novel is clearly in its political message, and here it is undone by well-intentioned but thoughtless sentiment. There are some problems too big, and too important, to be left to secret societies of special people.